Every Sunday I post a photo that I’ve taken somewhere in Israel. You can click on the image for a larger view (which may take some time to load depending on your Internet connection). I write something about the photo – where it was taken, the technical details of the photo, etc. If I don’t tell you where the photo was taken, I’m asking you to guess and add the location of the photo as a comment (in the end I’ll tell you). Please share this post via email, on Facebook or Twitter by clicking on the icons at the end of this message. This photo was taken with a Nikon D90 (digital SLR) camera with a Nikon 18-70mm lens in the afternoon of March 27th, (ISO 200, 18mm, F5.6 at 1/125 sec). 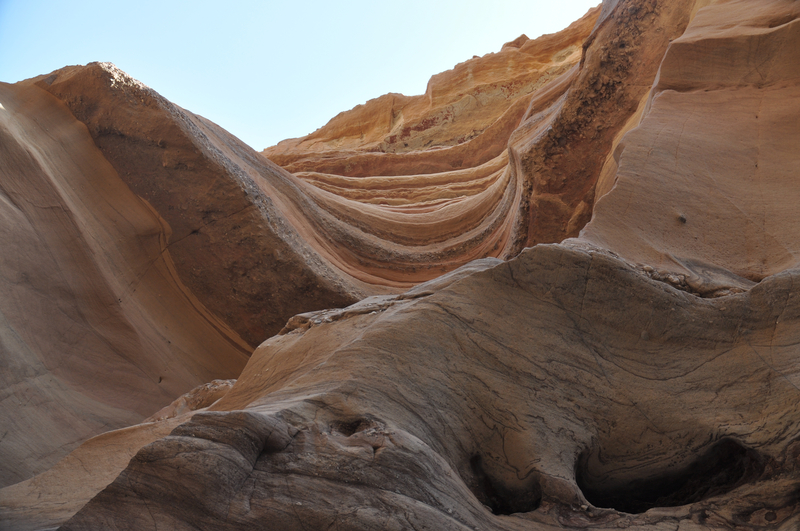 The photo is of the sculpted walls of the Red Canyon. For directions on how to get there and suggestions on other sites in the area check out my blog post.